A beautiful moment I managed to capture in the Helsinki summer! I’ve earlier blogged about how I find intuition and seeing the value of the tacit knowledge as very interesting perspectives for the decision-making. As social business and new ways of working are now changing the organizations and the entire business landscape, and further adding to the complexity – I’ll find it even more interesting to study decision-making and how understanding is created. I was looking for something else from my bookshelf and found the good old book by Stephen P. Robbins “Essentials of Organizational Behavior”, and randomly checked out the chapter about individual differences in decision-making. What I found was an interesting quadrant that describes the leadership styles related to the decision-making, it has two axes: Way of Thinking and Tolerance for Ambiguity. The four styles of decision-making are: Directive, Analytical, Conceptual, and Behavioral. So here’s a quick go-though of this model, followed by my free associations from it. Way of Thinking, very simplified: Logical, analytical leaders are processing information serially versus intuitive and creative ones perceiving things as a whole. Tolerance for Ambiguity, again simplified: some of us have a high need to structure information in order to minimize ambiguity, while others can process many ideas and thoughts simultaneously. Analytical types have a better tolerance for ambiguity than the “traditional” directive decision-makers. An analytical type of leader usually search for more information and alternatives than directive ones. Leaders applying the conceptual style in decision-making are often considering many alternatives out of broad perspective. Additionally they take a longer term perspective. This style gives most room for creativity, the authors claim. The forth style, behavioral style, is the most receptive for suggestions from others, peers and subordinates, and leaders of this style love the meetings! They are also trying to avoid conflicts and find a consensus. In Finland we call the behavioral style as a Swedish leadership style: it is based on utterly politeness and caution, and taking ages to get any decisions. Meanwhile the traditional Finnish way has been the opposite; very direct, focused on the matter (seeing people as resources, no space for feelings here) and with low tolerance of ambiguity. The formal business education in Finland has a long time emphasized the rational analysis and thinking which have led to this ‘inflexible’ style. Naturally leadership styles are developing here in the Nordics too. But I think we Finns have much more home work to do than our friends in Sweden. I very much agree with her and that is exactly why I wanted to look at the model, via three associations I spontaneously got. Value and Importance of Listening. Firstly, this decision-making style model and its division associated with the Finnish philosopher Esa Saarinen and his research of Systems Intelligence. Saarinen and his fellow researchers describe the two ‘thinking systems’ we all have: System 1 thinking as automatic, associative, and intuitive. System 2 thinking is dominating in the work places: you better be strictly rational. In every day work situations the System 2 thinking is active and often unintentionally blocking System 1 thinking – and therefore narrowing the possibilities at hands. When both systems are active, there’s a room for intuition, interaction and emotions – and for better understanding and decision-making. Being strictly rational in your work role is not working anymore. We need utilize our full potential. I have blogged about this earlier e.g. in posts “Mental Bodybuilding for Knowledge Workers” and “Are You Systems Intelligent?” featuring my favorites Hagel and Saarinen. Secondly, I thought of the on-going lovely discussion about serendipity, a discussion where John Hagel, Luis Suarez and Ana Silva are the ones I love to follow, to interact with and listen to. When I saw the decision-style model I was right-away thinking about replacing the Tolerance of Ambiguity into the Level of Embracing Serendipity. 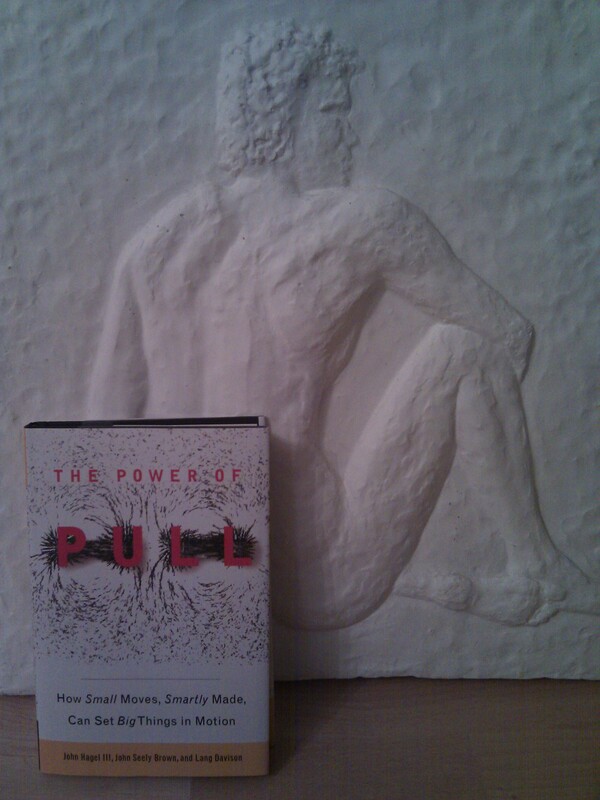 It would broaden the model towards the thinking of the “Power of Pull model” (by John Hagel, Lang Davison & John Seely Brown). I agree with them that the cloud-enabled new platforms for serendipitous encounters lead to new kind of innovation, decision-making and leadership. We can now easily meet companies and people we did not know existed, and this helps us to be more creative and also broaden the basis we rely on when making decisions. The edges are fruitful places for the innovation, to help us to make innovative decisions, but also for supporting a better understanding. The approach both Esa Saarinen and John Hagel & his fellows suggest helps us in achieving our full potential as individuals, and the same applies to our organizations, via the people in it. In addition, serendipity can be shaped, and utilized in decision-making. The third association I got is the value and importance of listening in decision-making, and in life in general. I serendipitously bumped into a beautiful TED Talk by Julian Treasure (what a lovely last name he has) about the importance of listening. I warmly recommend you to listen to his talk (7:50 min), very inspiring. Yes indeed, active listening deserves our attention in the chaotic and changing environment, too often forgotten. In his talk Julian shares five tips for better listening. I found the fifth one, his RASA model, beautiful and absolutely something every one of us should apply in our daily life and the decision-making situations. Acronym RASA comes from Receive, Appreciate, Summarise, Ask – and these four verbs should be part of our personal decision-making, learning processes, and leadership. Julian says aptly: Conscious listening creates understanding. I’d like to add that listen not only your peers, colleagues, family members and friends, but listen to yourself too. Genuine interaction, collaboration, learning, openness, sharing, trust, P2P instead of B2B & B2C, living network instead of stiff hierarchies, listening, intuition, passionate creativity, and embracing serendipity. All these leading to not only learning and better understanding but also to better decision-making, and success in whatever you are doing. Personally I have so many things that I need to do differently. Starting today. EDIT 2011-08-02: Professor Esa Saarinen’s research can be found here. As part of my unlearning and learning process towards better understanding of Social Business I’ve been thinking back the time I worked for a Swedish Supply Chain Management (SCM) company IBS. Yes, I am recalling the attempts we made in order to build a platform for a global wholesale distribution, the concept was called as Virtual Enterprise. It is now most interesting to follow the discussion about social business design and to find many similar perspectives. Simultaneously with The Power of Pull, a warmly recommended read, I have been re-reading older European research about business process design (pdf), written by two Swiss gentlemen Elgar Fleisch and Hubert Österle. Already eighteen years ago (!) in 1993 they created an interesting concept of Integration Area that refers to organizational processes which are characterized by high dependency, and therefore require a high degree of coordination. They discuss the complexity of inter-organizational networking which is associated with human interaction, organization structure, and the culture. In order to reduce this complexity, Fleisch and Österle presented the Coordination Areas. 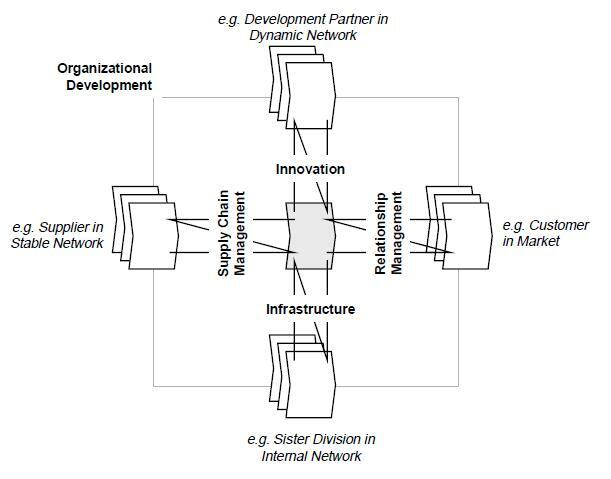 The five coordination areas that are highly dependent of each other are: Supply Chain Management, Relationship Management, Innovation, Infrastructure, and Organization Development. The difference between these two concepts is that the integration area pursues integration through integrated information processing, while the coordination area pursues integration through the organization of dependencies. Related to the latter, organization of dependencies, an interesting parallel could also be drawn to the systems theory and its qualitative determinants. Two system determinants, attributes of the elements and the degree of the organization among system elements, employ the same kind of complex dependencies. It is easy to find confluence. After reading some of the recently published books related to the social business and comparing the models and messages in those to this older research – you can find many themes that are in common. Fleisch & Österle state that coordination of business processes have to cover both outputs and all associated design areas such as process, IT, people, organization structure, and culture. The efforts my company made 10-15 years back, associated with Supply Chain Management, were directed towards this kind of coordination of the inter-organizational processes. Yes, there’s a clear connection between these SCM development efforts and Social Business/Enterprise 2.0! Exactly as Jacob Morgan tweeted while ago. Fleisch and Österle developed a model called “Five computerization phases towards business networking”. They describe an integration area as an indicator of the degree of “informatization” of an organization. The size of integration area is growing while technology develops. Well, this reminds me of Enterprise 2.0 when seen from a tool & information perspective. However, their model was not yet very social one. On the tool side, the new portal technologies as the tools to give a common view of supplier relationship related information and system integrations for integrated processes. For example information stored in the ERP, CRM and Human Resource systems. Very much system and information flow centred approach. A bit like pre Social Businessian, isn’t it? Summarized it can be said that the focus were clearly around the processes, work flows and managing information within the processes. Some initial ideas for the collaboration on the individual level were present, but were still rare in the businesses. What was missing then was naturally the emerging new communication culture and the possibilities enabled by social media – to connect, discuss, and to create value also on the individual level. The focus is now broadening from the system level to the human level: how individuals communicate, interact and create value together has become essential. The core concepts have changed from the pure process view with task descriptions, detailed instructions and strict control towards empowerment of people, enhanced interactions inside and outside of the own organization, away from the information/knowledge silos – all this supported by the new kind of social technology. However, there’s much to do. Firstly, we are still often calling people as resources or assets, sigh! We do have Human Resources departments, like people were parts in a machine. And secondly, social media is often reduced to a set of tools only. At the most basic level, pull helps us to find and access people and resources when we need them. At a second level, pull is the ability to attract people and resources to you that are relevant and valuable, even if you were not even aware before they existed. Finally, the third level of pull – the ability to pull from within ourselves the insight and performance required to more effectively achieve our potential. I do believe that the Pull approach enables us to learn faster and translate what we’ve learned into improved performance; the performance of ourselves but also the people we connect with. I fully agree with them. I will continue to study social business design and how to use the power of pull to access new sources of information, to attract like-minded individuals, and to shape serendipity to increase the likelihood of positive chance encounters. 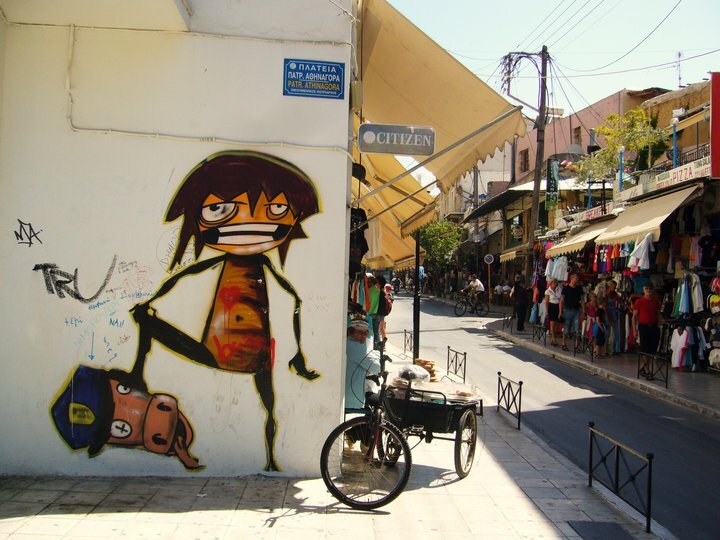 Still much to learn for a Serendipity Hippie like me. The passion will help me on the way. PS. Dachis Group describes the Social Business Design in a way I like a lot. Their model covers how customer can participate in the value creation, how to enhance collaboration, and how to rethink and optimize the value network. The latter – Business Partner Optimization – is quite close to the Virtual Enterprise concept I was working with in the end of the 90’s. It is fascinating to notice how the basic ideas of social business have been around for a long time, and now finally becoming part of our daily business. Related reading from Dave Grey of Dachis Group – The Connected Company.